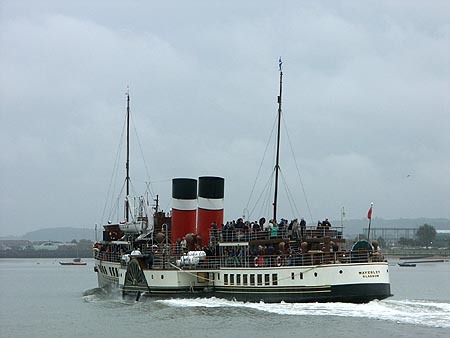 This page is devoted to photographs taken in 2004 of the Waverley Excursions preserved paddle steamer Waverley. 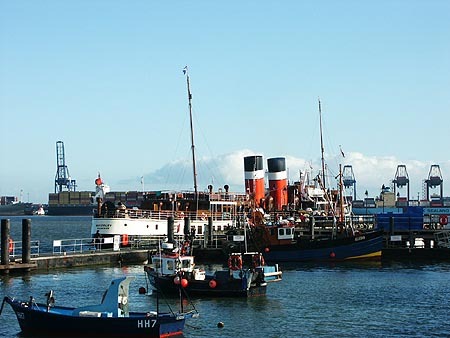 Waverley Photographs - 2004 - this page! 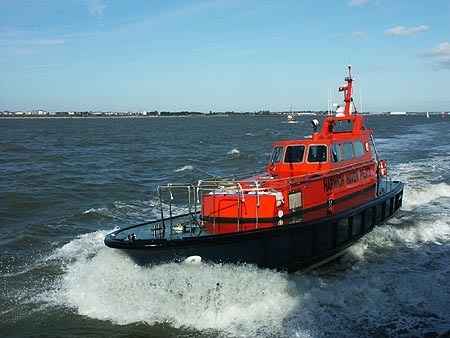 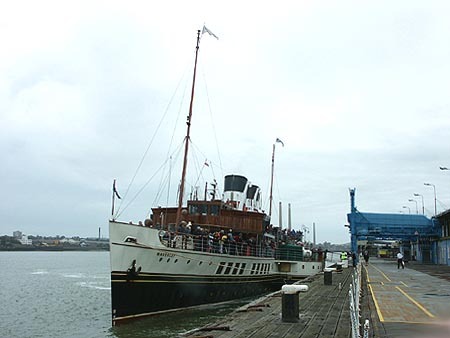 Shieldhall left Southampton at 10:00hrs for a non-stop cruise around the Isle of Wight. 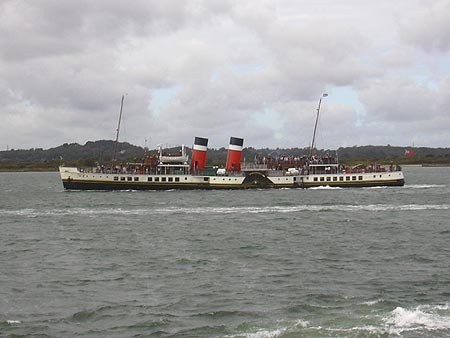 Waverley departed at the same time, calling at Portsmouth and Yarmouth, and was then scheduled to follow Shieldhall around around the Island. 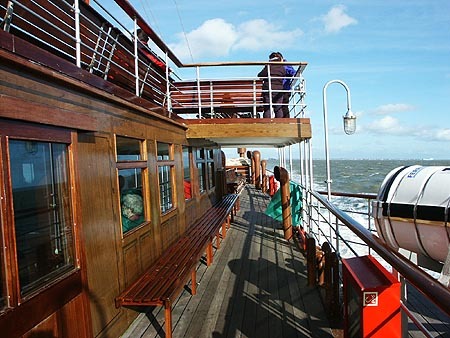 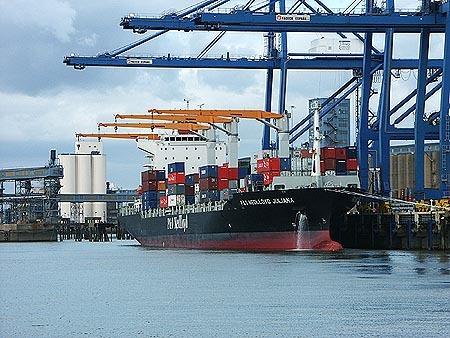 How often have two steamships circumnavigated the Island on the same day in recent years? 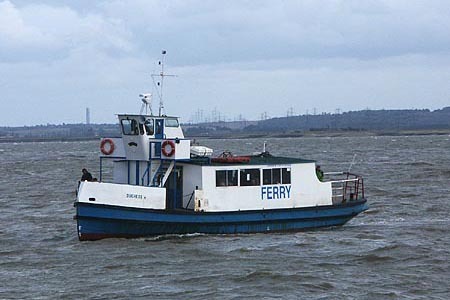 Despite poor predictions, the weather was sunny for most of the day, although choppy conditions were encountered by Shieldhall between the Needles and St Catherine's Point. 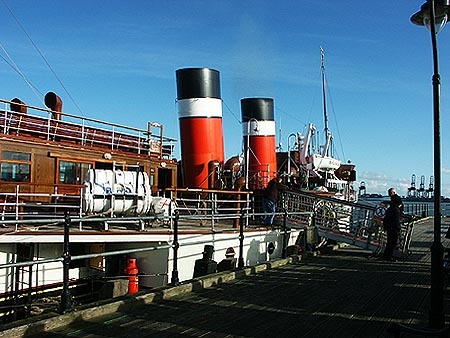 I would not wanted to have been on Waverley in such conditions, and indeed her cruise was diverted elsewhere. 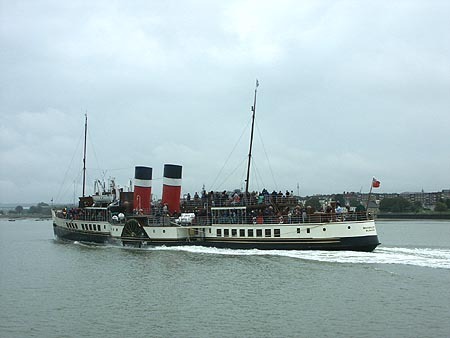 Waverley, leaving Southampton at 10am due to take a Round Isle of Wight Trip (cancelled due to weather). 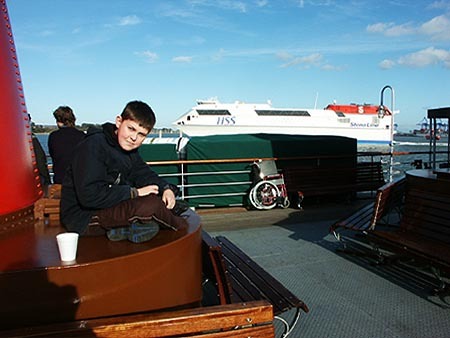 Photo: &COPY; Ian Boyle, 11th September 2004. 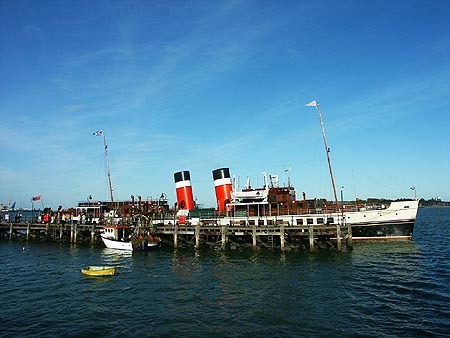 Waverley at Tilbury on a cruise from London to Southend and the Thames forts. 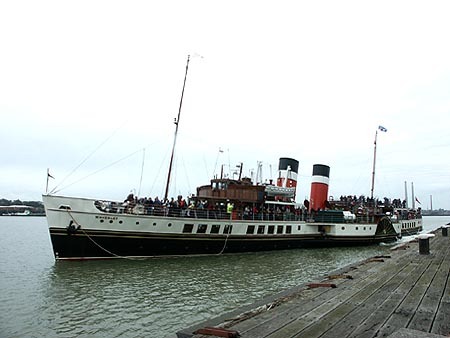 Waverley left Harwich at 10:00hrs for a single voyage to Clacton, Tilbury and London Tower Pier. 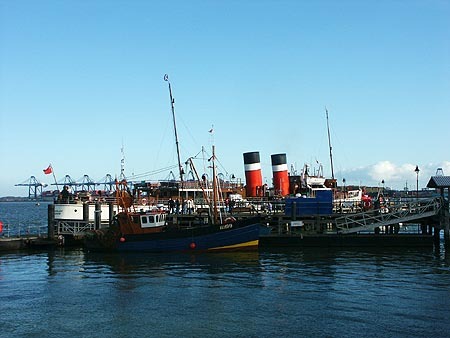 Waverley at Harwich prior to departure. 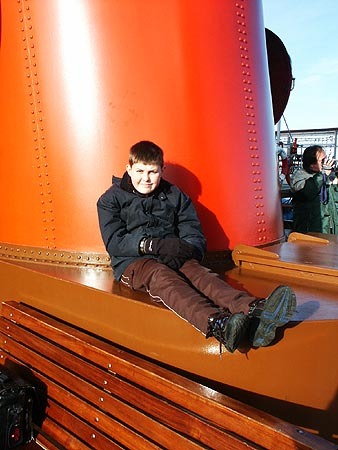 Alastair on Waverley shortly after departure. 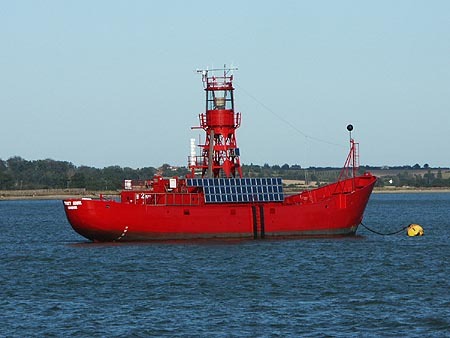 Trinity House lightship at Harwich. 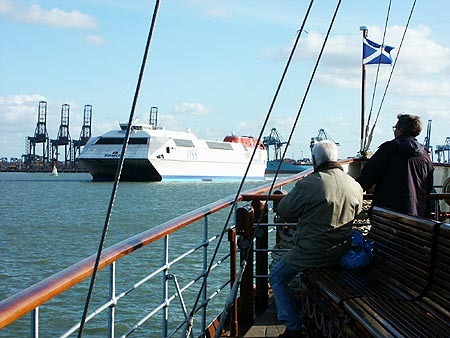 Stena Line's HSS Stena Discovery arriving at Harwich shortly after the departure of Waverley. 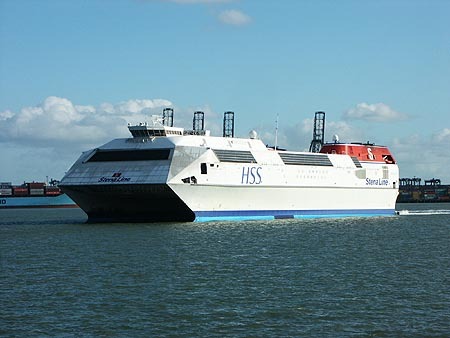 Stena Line's HSS Stena Discovery arriving at Harwich from the Hook of Holland. 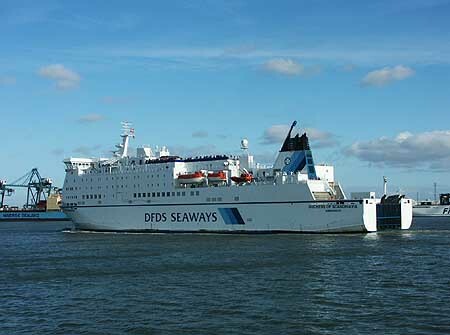 DFDS Seaways ferry Duchess of Scandinavia arriving at Harwich from Cuxhaven. 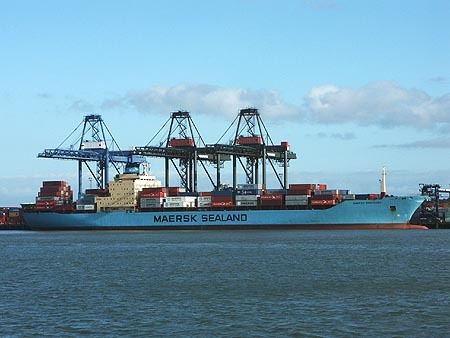 Container ship Maersk Barcelona at Felixstowe. 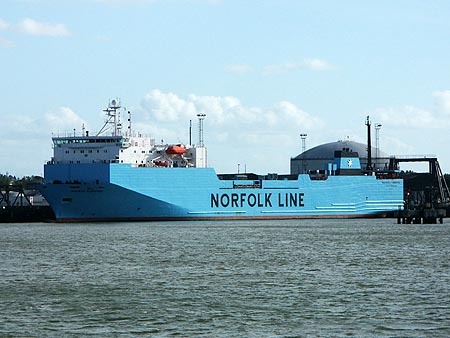 Norfolk Line ro-ro ferry (also owned by Maersk) at Felixstowe. 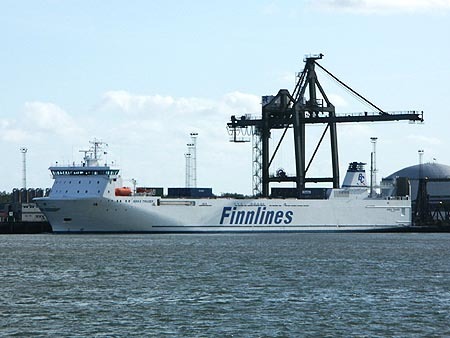 Finnlines ro-ro ferry Birka Trader at Felixstowe. 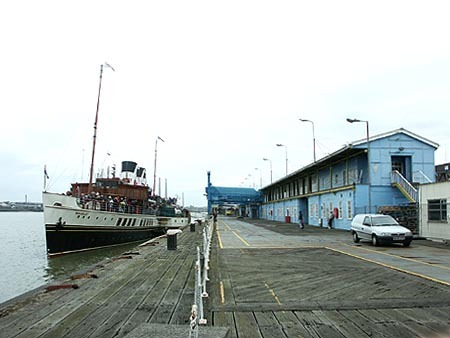 The Tilbury-Gravesend ferry Duchess M.
P&O Nedlloyd container ship P&O Nedlloyd Juliana at Tilbury. 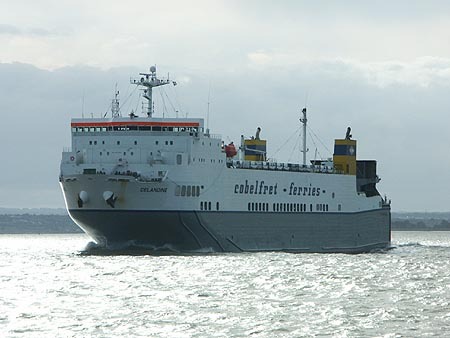 Cobelfret ro-ro ferry Celandine in the Thames, after leaving Purfleet. 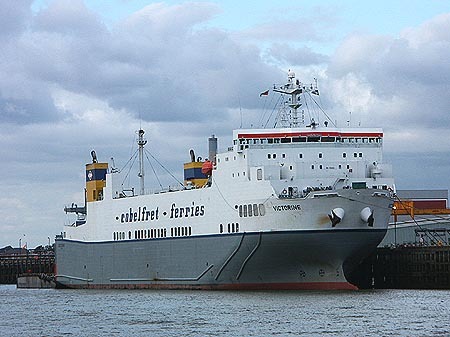 Cobelfret chartered ro-ro ferry Louise Russ in the Thames, after leaving Purfleet. 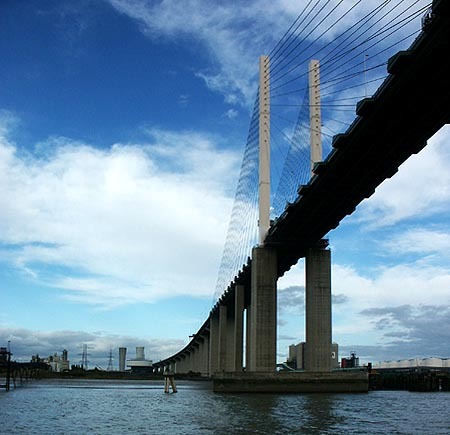 The Queen Elizabeth 2 bridge at Dartford. 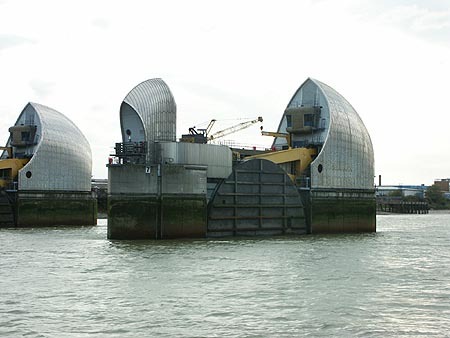 The ventilators for the parallel tunnel are also visible. 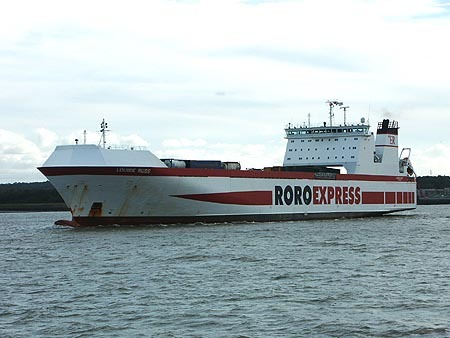 Cobelfret ro-ro ferry Victorine at Purfleet. 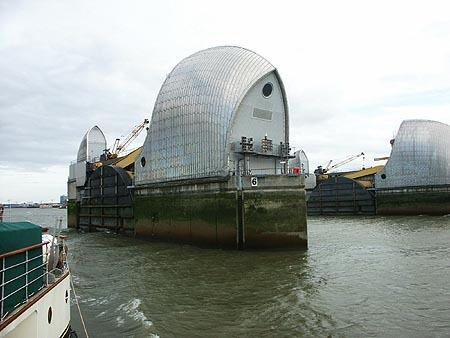 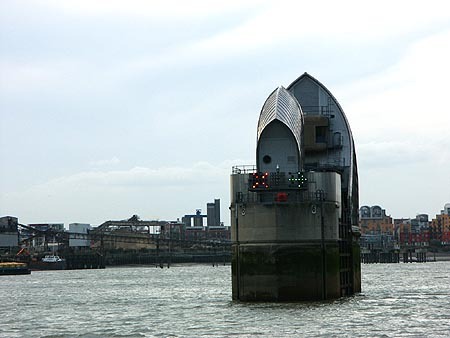 The Thames Barrier near Greenwich. 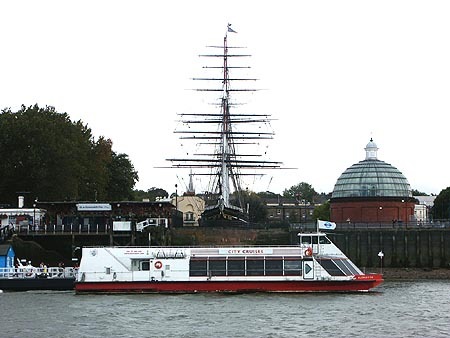 City Cruises' London-Greenwich excursion ship Millennium of Peace at Greenwich, plus the masts of the Cutty Sark. 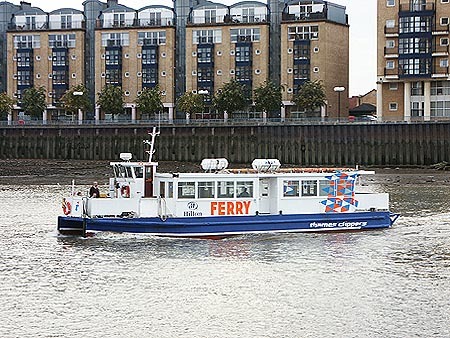 Thames Clippers' cross Thames ferry Twin Star at Canary Wharf. 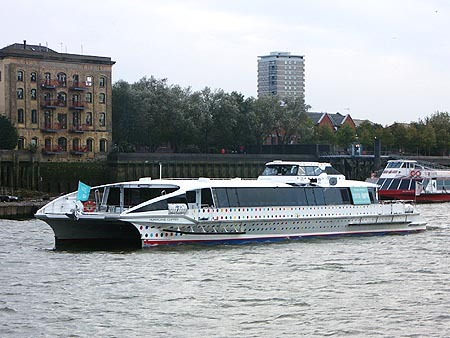 Thames Clippers' largest catamaran Hurricane Clipper. 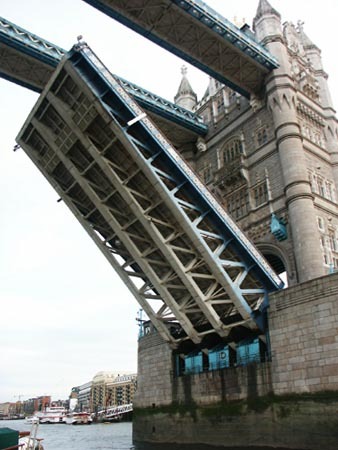 Passing under Tower Pier at the end of the trip.